Chest and back pad compartments (CE-certified Nucleon chest and back protector inserts available as accessory) for use when Tech-Air® is not installed. Additional reinforced polymer layer on critical elbow and lower arm areas for abrasion resistance. Reflective graphic details and logos makes the rider more visible to other road users in varying light conditions. Front waterproof cargo pockets for convenience and reassuringly secure closure. Removable long-sleeve thermal liner (100g body,80g sleeves) ensures comfort on hot or cold days. 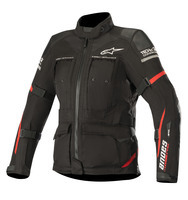 Alpinestars says: Designed specifically for the female form and using Alpinestars exclusive DRYSTAR® membrane, the Stella Andes Pro DRYSTAR® Jacket offers true versatility with 100% waterproofing and great levels of breathability, even in difficult riding conditions. The technically advanced construction of this jacket offers protection and abrasion resistance and is adaptable to all weather conditions. The Stella Andes Pro is also compatible with Alpinestars leading active airbag protection system, Tech-Air®.